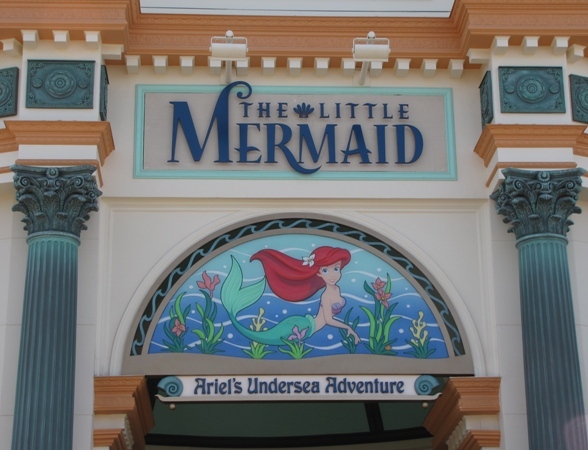 The Little Mermaid – Ariel’s Undersea Adventure has opened and it’s certainly one of the most delightful attractions to come to Disney California Adventure. 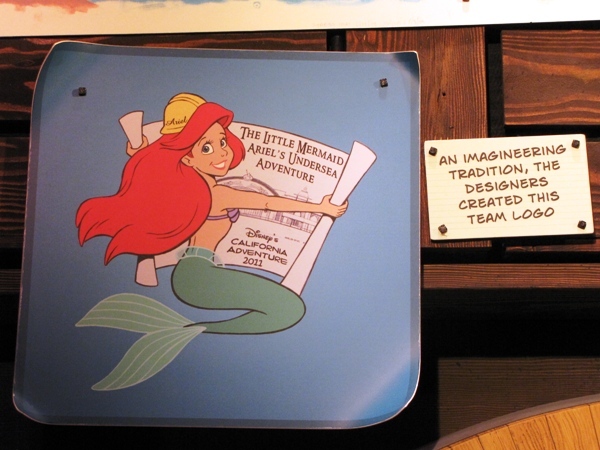 Disney fans have been anxiously awaiting Ariel’s arrival and I’m sure you’ll agree that the wait was well worth it. 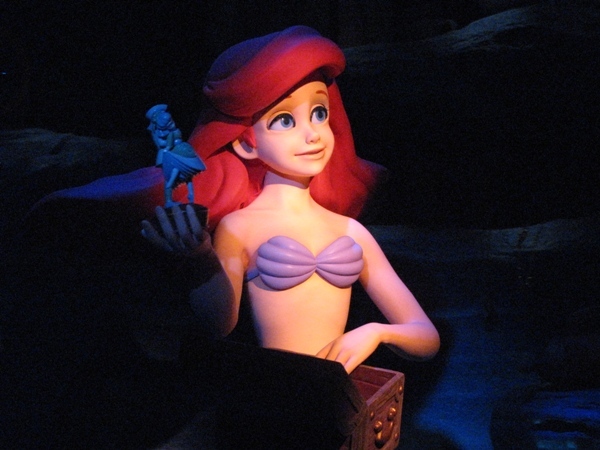 Ariel and all her pals have come along with all the sights, the sounds and the familiar music that have made this story a classic. 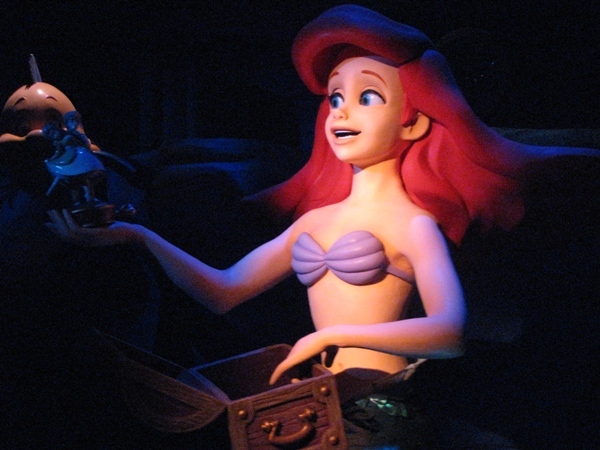 So come with me and we’ll explore The Little Mermaid – Ariel’s Undersea Adventure! 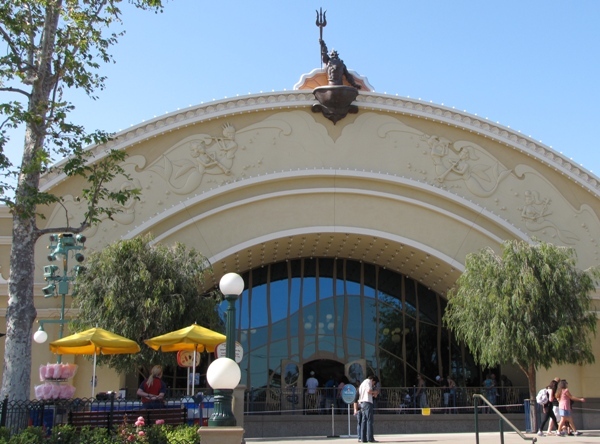 The Little Mermaid building is big and that is a hint of what’s inside. The artwork and architecture is gorgeous and there are details everywhere. The colors are vibrant and that is reflected all over the attraction. 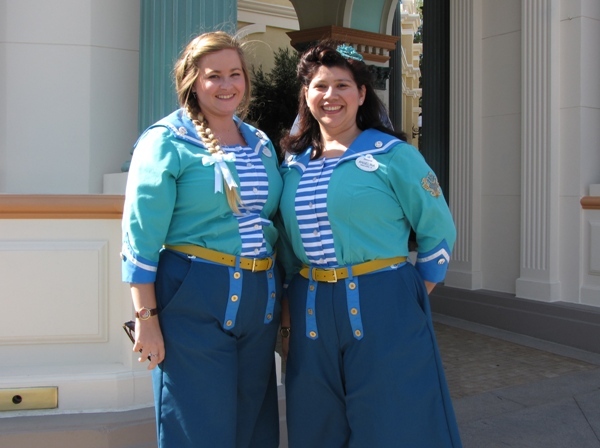 Even the cast member costumes are wonderfully colorful and fun and reflect a seafaring theme. 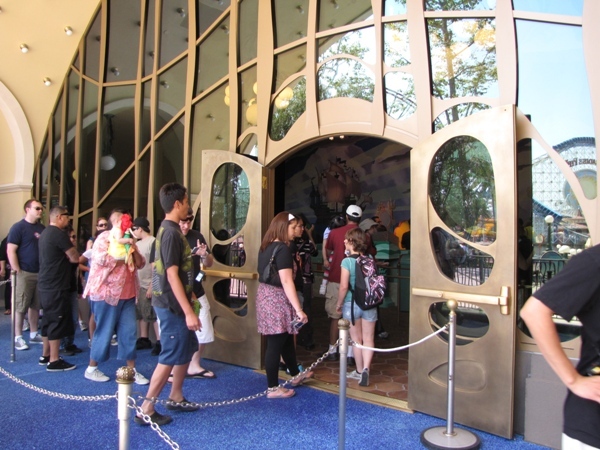 The queue line is fairly plain, but it moves well and I expect even on crowded days this queue will move quickly. Once inside the building, you move quickly to the loading area. 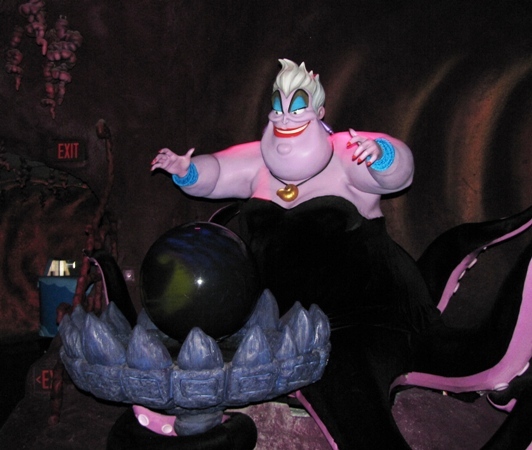 Little Mermaid uses the Omnimover system (similar to the Haunted Mansion). 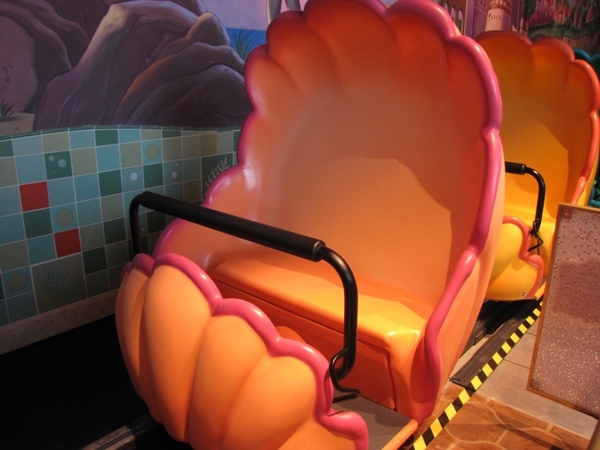 The vehicles are brightly colored clam shells. 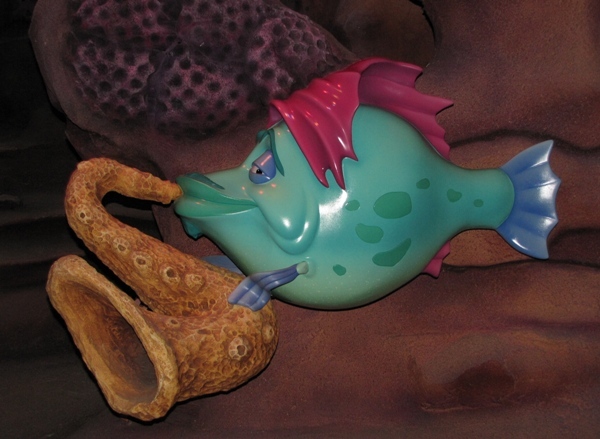 Like most “Fantasyland” style dark rides, Little Mermaid tells a story and that story begins with our narrator Scuttle telling us about Ariel. Well we can’t spend all day on dry land. Not if we want to be “part of her world”. 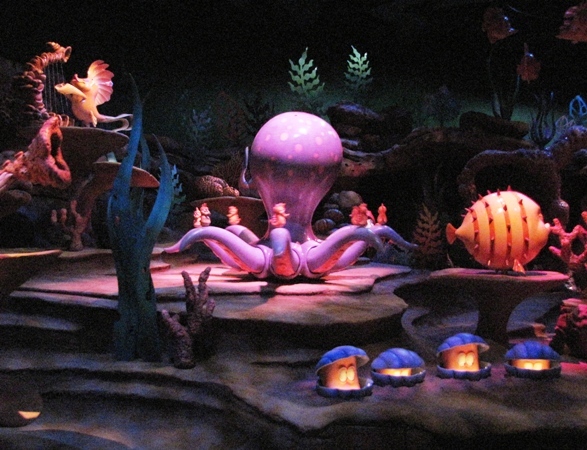 So next we go undersea with a great special effect that makes us feel like we’re descending into Ariel’s domain. 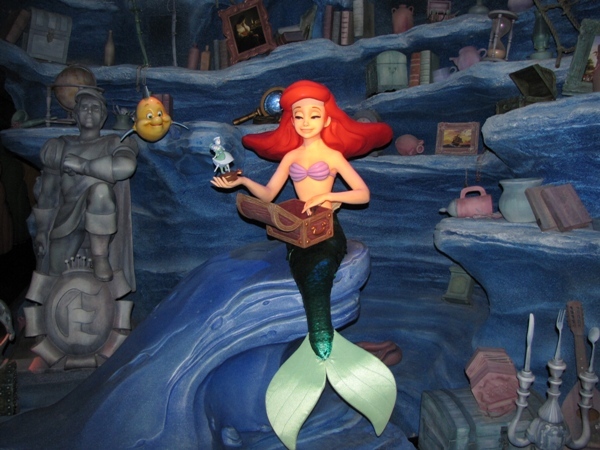 Right away we meet Ariel in her treasure chamber singing the familiar “Part of Your World”. 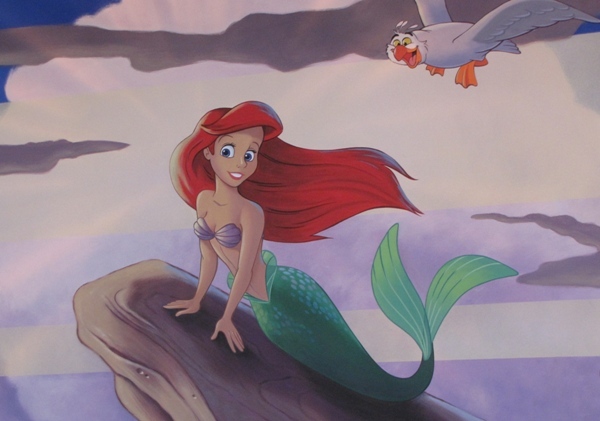 Ariel is spectacular and her movements are very smooth and flowing. Audio-animatronics just keeps getting better with every attraction. And look at those eyes! What guy’s heart wouldn’t melt? 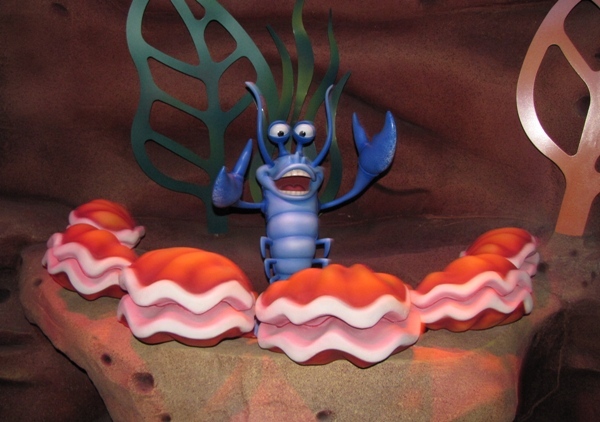 Next we go to the big party scene accompanied by Sebastian leading everyone in singing “Under the Sea”. In here all the clamshells circle the room and face inward. All I could see was young hands pointing at all the characters all with eager enthusiasm. Trust me; the kids are gonna love this! Ariel too is dancing to the party. The way the scenery hides the character mechanisms is very well done and you are never distracted by out of place support pieces. All the fishes play along. Well, every good story has an element of danger or evil and unfortunately Ariel encounters some. 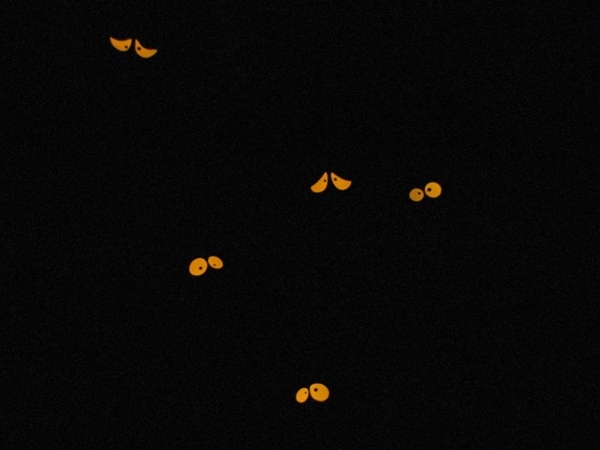 Flotsam and Jetsam appear overhead and warn of things to come. Ursula! What a name. And here she is in all her glory (or should I say all her gory)! Ursula wriggles and moves and is an impressive character. It will take a couple trips to take all that is in this scene, but notice how she moves and that there are no seams or gaps in the character’s moving parts. Like Ariel, Ursula’s movements are very fluid and actually quite lifelike. In fact, she down right creepy! But if Ariel is to succeed, she got to find true love right? 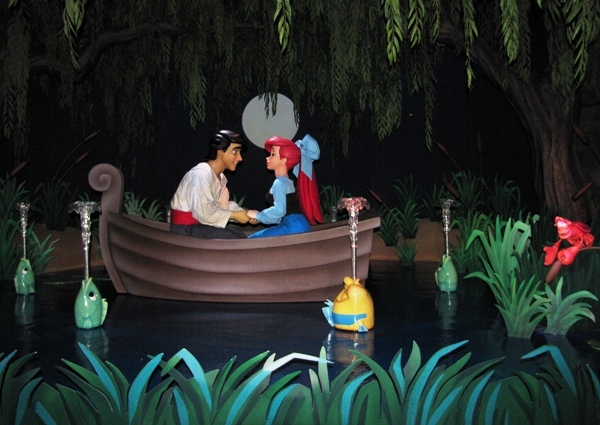 And the way to prove that is to get Prince Eric to “Kiss the Girl”. Accompanied by Sebastian, Ariel and Eric float by under the moonlight. And of course, true love wins, Ariel gets her voice back and Ursula is defeated. Ahh! 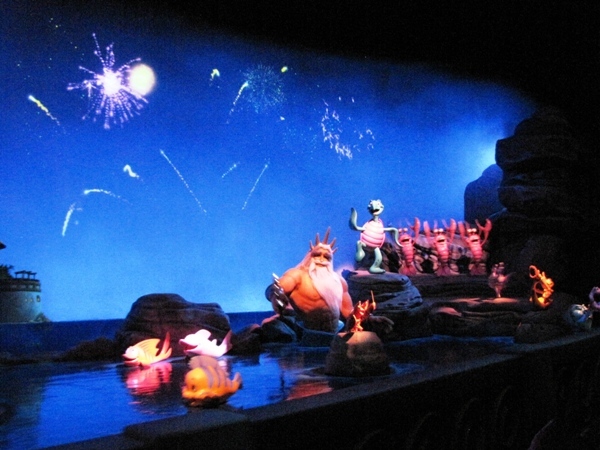 The finale scene brings everyone back together including an appearance by King Triton. Fireworks are animated in the background and all the characters celebrate. 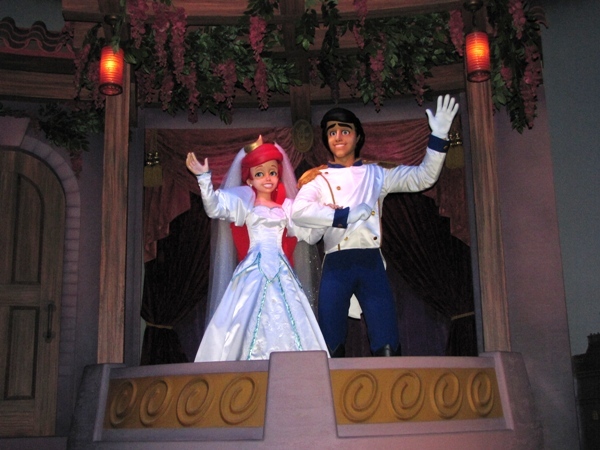 A of course, Ariel and Eric live happily ever after! 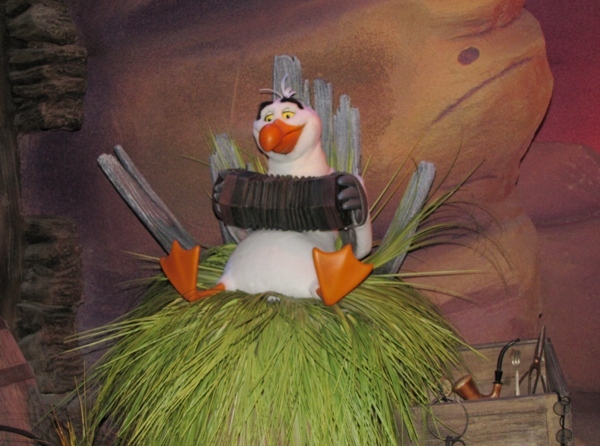 A finale farewell from Scuttle wishes us goodbye. This is a wonderful attraction and I’m sure it will be a big hit for a long time. Every kid I saw get off the ride was smiling ear to ear and most immediately were talking about what they saw. (And that’s what it’s all about isn’t it?) Even the adults (including me) were pleased. I heard nothing but good things from everyone who was commenting. I think we have a winner! 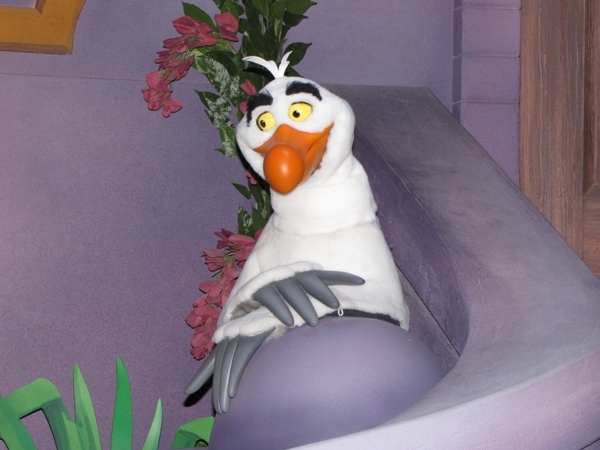 Now, like most Disney fans, we tend to set our expectations way above the capability of any Imagineer. Remember that this is not Pirates or the Haunted Mansion. 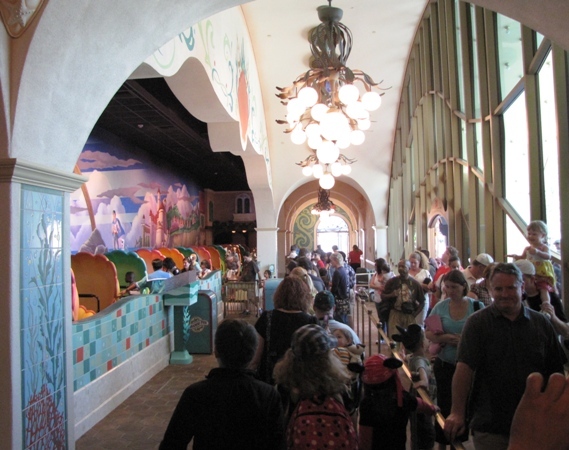 This is a Fantasyland style dark ride comparable to Peter Pan and Pinocchio. Of course this ride has been dialed up and it shows. But don’t expect to be blown away by unbelievable special effects and never before seen technology. 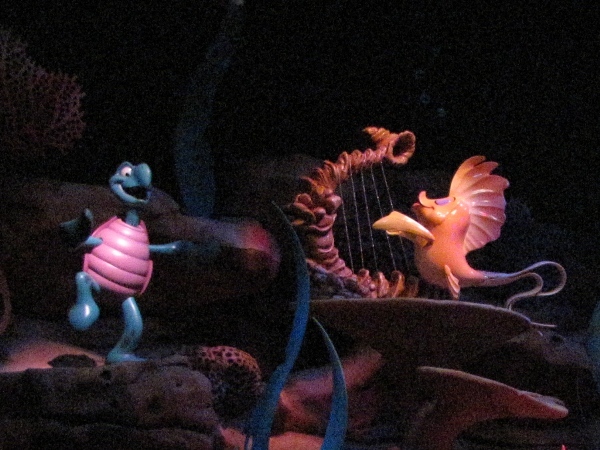 Little Mermaid is, at its core, a simple dark ride. 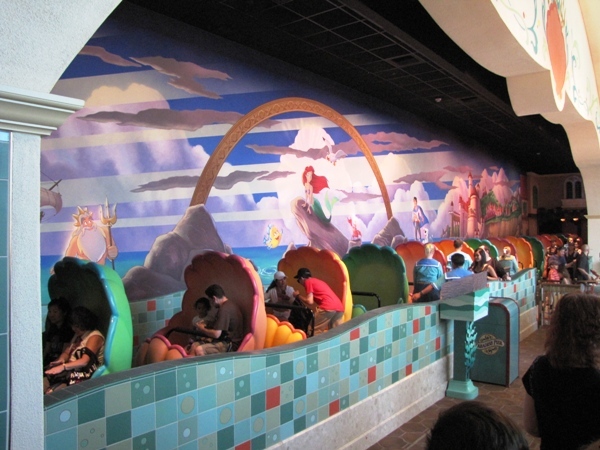 But it’s arguably the best Disney dark ride for kids to date. 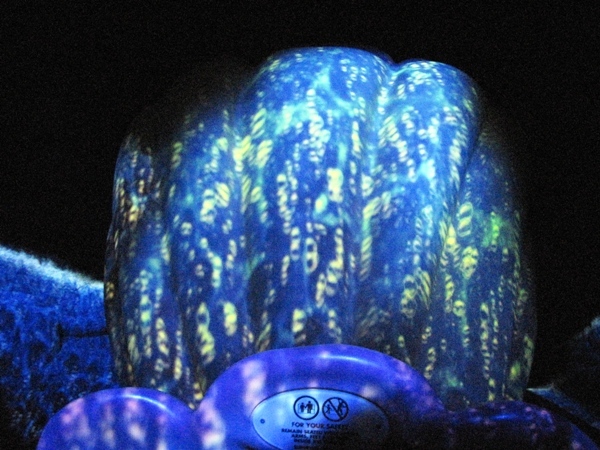 Are there flaws and some strange things in this attraction? Of course. Most notably is that the transition between scenes seemed a little long to me with very little visible. 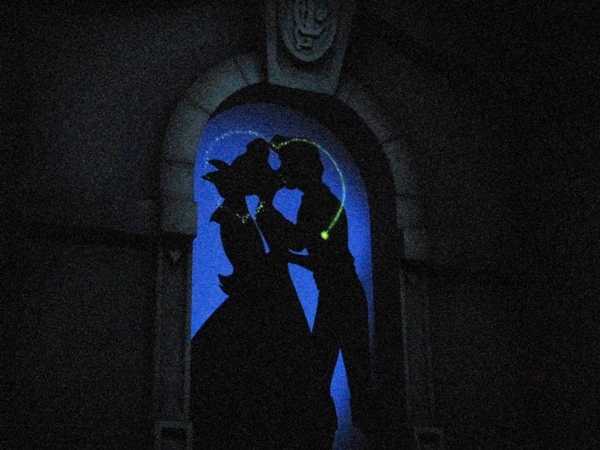 We’re used to dark rides where one scene follows the next scene immediately. There are some long gaps in Little Mermaid where we’re just moving through the cave to the next scene with nothing going on. And some of the scenes definitely feel like there should have been more there. Unfortunately the big party scene and especially the finale scene seem a bit thin. What is there is good, but I think there could have been more. Maybe the Imagineers left some room for improvement and we’ll see this attraction grow over time. Over at the Blue Sky Cellar there are some great displays of the attraction technology and designs. 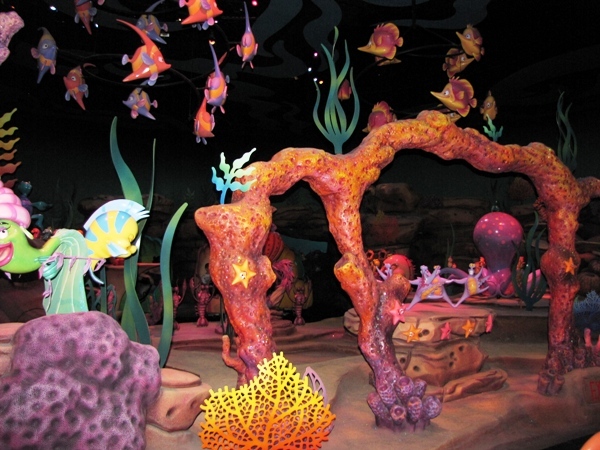 Here’s my recommendation: go see Little Mermaid first, then go over to the Cellar and see how it’s all done, then go back and ride Little Mermaid again and you will be amazed at what you see. Trust me, this is great! 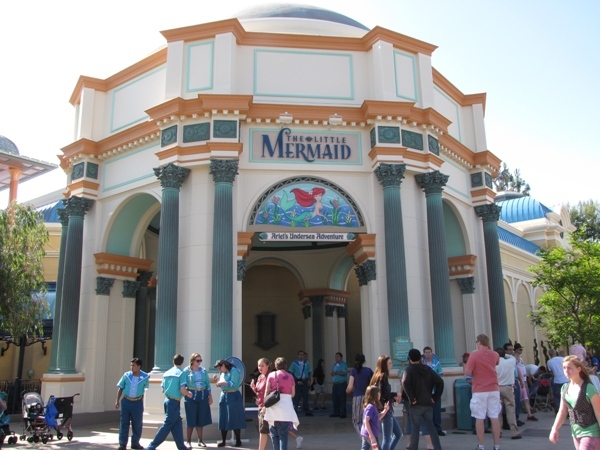 Little Mermaid has been in soft opening for a couple weeks, but the official grand opening was on June 2nd. Check out the opening ceremony event here. 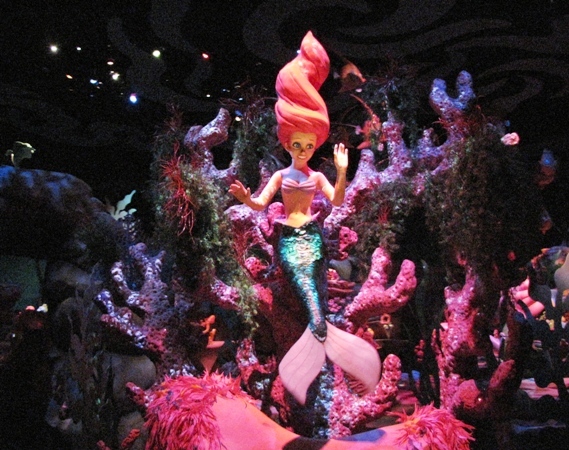 I thoroughly enjoyed The Little Mermaid – Ariel’s Undersea Adventure. I was able to attend one of the soft openings just before the official opening and I rode it 7 times in a row! The last couple times I just sat and watched without trying to take pictures or study the details. 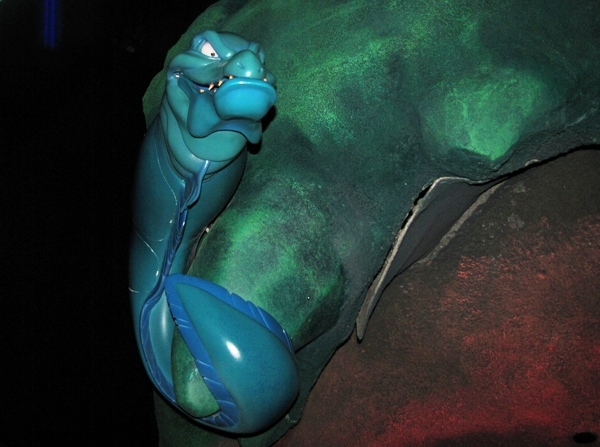 Little Mermaid is a wonderful attraction and I know everyone will love it!